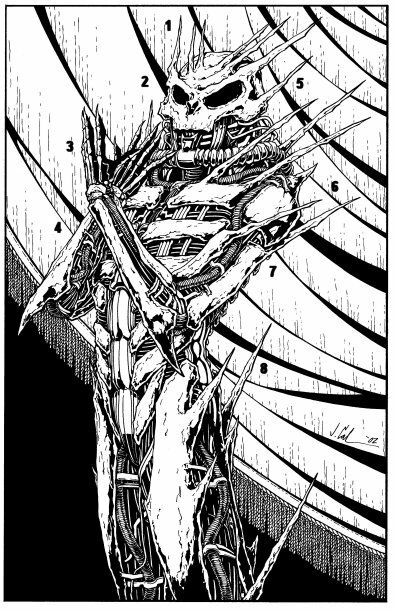 Though the armour of Faction Paradox is variable in form - inevitable, given that it can't exactly be mass-produced - all the suits have key features in common, with significant variations being found between cliques (or cabals) rather than between individuals: most personal customisations of the armour are purely aesthetic. The suit seen here may not exactly be average, but it contains most of the usual fixtures.“ Note also that different models of armour are worn under different conditions. For diplomatic (and purely ritual) occasions Faction agents wear no real armour apart from their ceremonial headpieces, while in open warfare they tend to favour lighter, more flexible, less elaborate protection. The suit seen here might be described as the armour of standard bearers”, worn on the battlefield - if the War can be said to have any real battlefields - but designed to make a specific impression. Typically the Cousin-proteges would wear this model of armour, allowing them to act as go-betweens for the Mothers and Fathers while under fire.“ As a result, this suit can best be described as part armour and part carnival construction, and its heavy use of skull-and-spines imagery may be more than a little tongue-in-cheek. Headpiece. Far more elaborate than the standard ceremonial masks [see the Book of the War cover illustration]. The Military Wing tends to bring out the Faction's more exhibitionist tendencies, understandable considering that among its members ritual's far more common than actual battle. Faceplate. The features of the armour-suits have an animalistic quality simply because of the parts used in their manufacture. Though bat-like cranial structures are most common, the wearers' habit of personalising the faceplates often make the original breed difficult to identify. Handling Gloves. The heavier versions of the armour include gauntlets specifically designed to handle the dead-time/ deep-time resources of the Houses. Both Faction Paradox and the Remote employ heavy-duty handling gloves when collecting time-engineered or entropic materials. Ribcage. Various kinetic dampers are set into the fabric of the suit beneath the original skeleton, suggesting that the bone itself offers very little real protection. The entire torso section is jointed at the sides of the body (allowing it to be opened and removed as a single unit). Enhancements. In many cases sensory reinforcements will be set into the headpiece, although this practice is increasingly uncommon: in step with the newer methods of the Houses, these enhancements are now more often coded into the biodata of the Faction's recruits. Quills. Not universal, and purely decorative. Though in general quills are only seen at the larger ceremonial events, every full-sized suit of armour is likely to feature at least one item of personal significance to its owner, usually welded into the suit's basal structure. Feathers aren't unknown. Armpieces. As with the ribcage, the protection offered by the bone is apparently minimal. Here the original skeletal structure is held together by at least one layer of forced-matter sealant, which not only insulates the wearer but frequently irritates enemy monitoring techniques. Spurs. Theoretically, in close-quarter combat the sharpened edges of the larger bones can be used as weapons. Realistically, in a War of this nature close-quarter combat is almost unknown and in the field the suits are chiefly used while putting their occupants into the right positions. Most time-active battle is about placement above all else.